Two of the nation's top high school teams will wear new Under Armour gear for the City of Palms Basketball Classic. Orange County's Winter Park High School and Memphis Melrose are two of the team's participating in this week's 38th Annual City of Palms Classic Basketball Tournament. City of Palms, a yearly holiday affair, is one of the most noteworthy hoops tourneys in the country. Out of all the players who have competed in the tournament, 530 have gone on to play Division I NCAA ball. More than 60 of the tournament's stars have gone on to play professionally, including 38 guys currently on NBA rosters. Names include Chauncey Billups, Tyreke Evans, Kevin Love, LaMarcus Aldridge, Trevor Ariza, Brandon Jennings, Joe Johnson, Gerald Wallace an John Wall to name a few. The "who's who' of recruiting also make trips out to City of Palms, with guys like Coach K, Rick Pitino, Roy Williams, Doc Rivers, Larry Bird and Donnie Walsh being some of the big named scouts. Needless to say, City of Palms is about as good as it gets when you're talking high school basketball tournaments. If Winter Park sounds familiar to you, it's probably because ESPNU #1 ranked player Austin Rivers is expected to be the next big name to arrive on the basketball scene. Son of Boston Celtics head coach Doc Rivers, Austin recently committed to spending his future under the guidance of Coach K at Duke University. In the meantime, the two-time unanimous City of Palms MVP is taking care of business with his Winter Park Wildcat teammates. Winter Park will be wearing brand new Under Armour designed uniforms and sneakers for the City of Palms Tournament. The unis, touted as being 33% lighter and more moisture resistant than ever, are bright orange with metallic silver and black trim. Making sure they stood out, UA used reflective silver twill for the team name and numbers. 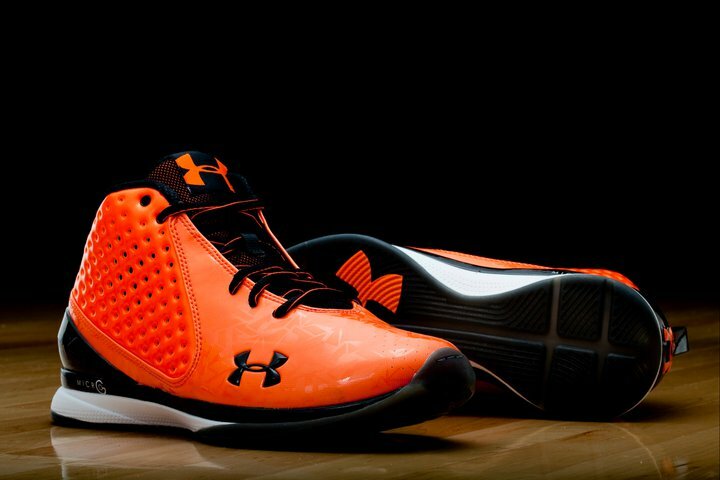 Additionally, the players have been supplied with orange-based Micro G Fly Team Exclusive sneakers. Black and white are the colors that compliment the kicks. Meanwhile, Tennessee Class 3A Champions Memphis Melrose waltz into the tournament led by forward Adonis Thomas, who the Sporting News ranks as the top player from the 2011 class. The highly coveted senior, who be a Memphis Tiger next fall, was said to have the potential to impact the game more than any other player in the class and have athleticism comparable to Vince Carter, Grant Hill and even Michael Jordan. Led by Thomas, it's easy to see why the Golden Wildcats of Memphis Monroe are one of the nation's top teams. Memphis Monroe has been fitted with sleek streamlined Under Armour uniforms as well. The new digs are made of black 4-way stretch material with crimson and gold detailing throughout. To accompany the uniforms, Under Armour hooked up the Wildcats with deep maroon colored Micro G Fly Team Exclusives. You can try and get a glimpse of these standout teams and new uniforms at the City of Palms Classic, which will end tomorrow with the championship game aired on ESPNU.